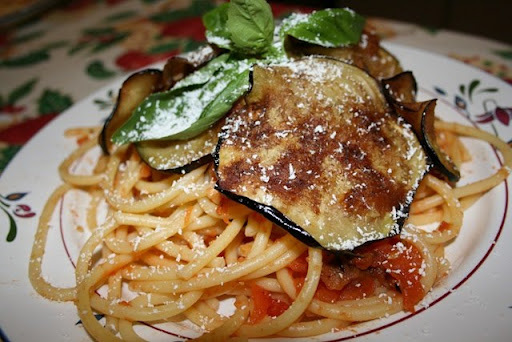 Sicilian cooking is recognised throughout Italy as one of the best in the country. It evolved over 25 centuries of foreign occupation and influence. The secret of Sicilian excellent cuisine lies on the island's climate, its fertile volcanic soil and history. Due to the warm weather, vegetables grow much better and are fresher and juicier, than other countries. Arabs introduced many crops in the ninth century: onion, sugar cane, bitter orange, pasta. Other cultures have also played a very important role: the Greeks introduced the olive and the wine; the Romans made of Sicily the breadbasket of the Western Empire and Spanish rule improved the preparation of fish. Eating in Sicily has never been just a question of keeping yourself alive, but an extraordinary experience of tastes and flavours as well. Centuries ago there used to be the so-called "baronial cuisine" or "Monsù" (from the French word Monsieur le Chef) and also ordinary everyday food. The "Monsù" cooking served in the palazzos of the nobility would have included grouper, sole, hare, wild boar, and the meal would have ended with a vivid-coloured cassata. These dishes would cleverly be adapted by poor Sicilians, using much simpler ingredients; sardines for example, used instead of sole. With different seasoning, ingredients and preparation, they could turn into "beccafichi" (stuffed sardines). Succulent quails became the far cheaper eggplants which could also be used diced up into little cubes and fried in the famous "caponata": mixed with capers and green olives, eggplants are served in sweet-and-sour sauce of ancient Persian origin. Panelle or chickpea fritters cooked in olive oil and flavoured with parsley are also of Arabic origin. Vegetables take pride of place on Sicilian dinner tables, and can either be served fried, as hors d'oeuvres, side dishes, salads and crudités. Pasta and rice of course have a long history in Sicily. It was the Arabs who set up the first pasta making-factory near Palermo in the beginning of the tenth century. And this took place three hundred years before Marco Polo brought it over from Catai. "Arancine", fried rice balls filled with chopped meat and peas, "crispelle" (sweet honey-dipped fritters) are typical examples of snacks. The most famous pasta dishes are: pasta with sardines and anchovies, raisins and pine nuts; alla "Norma" (with fried eggplants and grated ricotta cheese). No one was better than the Moslems at enjoying the pleasures of life, and they certainly had no intention of giving up good food when they were away from home. It was a certain emir called Ibn Timnah, who is said to have invented the timbale of rice or pasta, which is still today baked pasta or rice filled with chopped meat, tomato sauce, ham, cheese, peas and tosted breadcrumbs. And it was the nuns of the religious orders who made the delicious dishes they sent back to their families. That was the origin of the plump fragrant brioches filled with béchamel and tender baby peas, the golden pastry filled with meat and "caciocavallo" cheese, the various patès. Although you can find a limited number of meat dishes along the coast, you won't see the best dishes until you move deeper inland. The province of Ragusa is renowned for its superb uses of meat, especially beef, pork and rabbit. 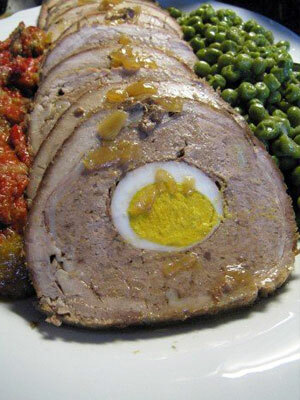 Its most famous dish is "falsomagro", a stuffed roll of minced beef, sausages, bacon, egg and pecorino cheese. Or the sweet-and sour rabbit, marinated in a sauce of red wine flavoured with onions, olive oil and bay leaves. As far as fish dishes are concerned, each town has its own specialties: "Polpette di nunnata" (fishballs, fried with parsley, garlic and grated pecorino cheese) is one of the most popular dishes from Palermo. In Messina "agghiotta di pesce spada" is a local classic dish made of sword fish, pine nuts, raisins, garlic, basil and tomatoes. Finally a popular food throughout the island is "calamaretti" (baby squid) prepared in a variety of ways: stuffed, fried or sautéed in a tomato sauce. Choice becomes hardest towards the end of a meal. The Arabs introduced sorbets, to the Sicilians' eternal gratitude. Etna provided snow throughout the summer and its preservation and sale was the lucrative monopoly of the Bishop of Catania. The habit of mixing sugar and jasmine essence dates from Arab times. 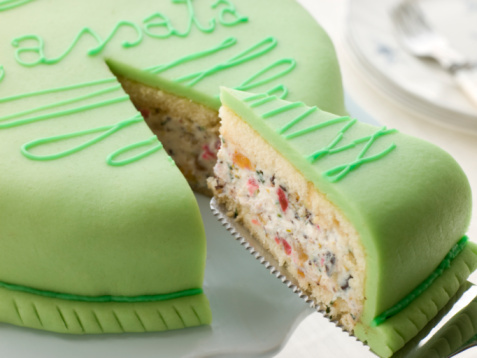 The most famous Sicilian cakes of Arabic origin are "Cassata" (made with ricotta cheese, sugar, vanilla, diced chocolate and candied fruit) and "Cannoli" (pastry tubes filled with sweet ricotta and candied fruit). Also home-made ice cream is a very important Sicilian tradition. For centuries, the chief pastry producers were nuns: Palermo alone boasted more than a score of convents, each famous for a particular sweet. Particularly traditional are marzipan cookies called in Palermo' area "frutta Martorana", named so after the convent which first began producing them. Also "Mustazzoli" biscuits and the nut-and fig-flovoured "Buccellati" are very typical Sicilian traditions. Today Sicily can compete with the more renowned wines of the Italian mainland. Especially in the last ten years, Sicilian wine-makers are winning worldwide esteem for mid priced and premium wines. Supreme master of white wine production is "terre di Ginestra", produced in the area of Palermo: the native "Cataratto" grape produces wines of grat intensity of fruity aromas and crispness. Opinions are divided on wether Cataratto or Inzolia, the other widespread native grape, makes superior wine. "Donnafugata Bianco" is an other excellent white wine. It is a rule for producers to make wines of different qualities and prices, the best coming from favoured vineyards or tight selections of the best grapes. The principle holds good for "Corvo",a well-known brand by Duca di Salaparuta, a company also keen on Inzolia. In the East of Sicily, you will find the best red wines. Messina produces the strong "Faro". Around Vittoria, south-east, the wine "Cerasuolo" is another of Sicily's best wines. Also Nero d'Avola has become an excellent red wine. Sicilian desserts wines are excellent. Top of the list is "Marsala", from the western port city, that can be sweet, dry, semi-dry and also flavoured with almond, strawberry or egg. Various "Moscati", "Passiti" can be added to this list.